The San Francisco Bay Area, host to the 2019 National Planning Conference and one of the most scenic regions of the United States, has it all. Found here are unique neighborhoods, a beautiful blend of the urban and natural worlds, and companies and institutions with global impacts. If you haven’t already, check out the full NPC19 program — including sessions, mobile workshops, and receptions — and make plans now to attend. While you are at NPC19 in April, be sure to get out and explore all that the Bay Area has to offer, including five Great Places in America. And before you go, take time to suggest your favorite neighborhood, street, or public space for designation as one of APA’s 2019 Great Places in America. Nominations are open through April 17. Fountain Circle, a majestic public circle with classical balustrade and fountain, was built in 1911 and restored in 1996. The circle's Fountain Walk once connected to a rail station and is now part of a unique network of paths and steps that crisscross Berkeley. Photo by Jill A. Martinucci. 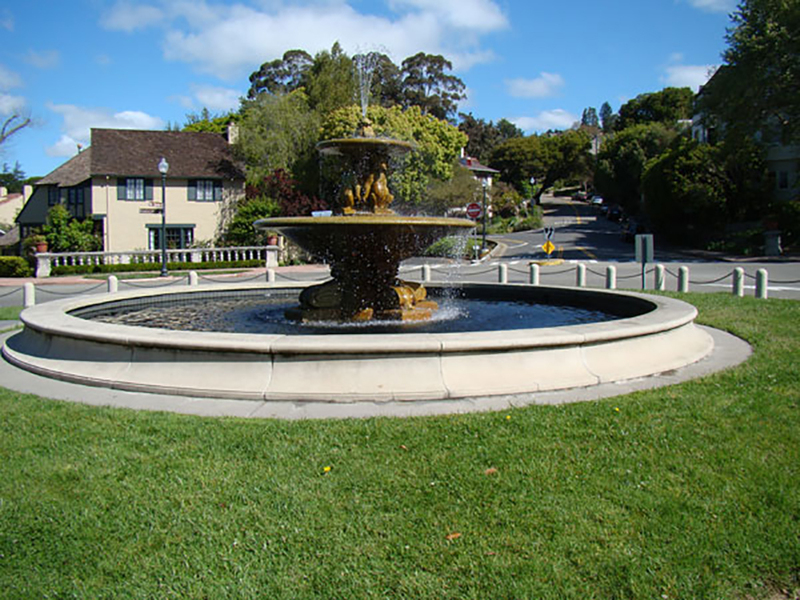 Situated across the Bay from San Francisco, the City of Berkeley is home to the tree-lined neighborhood of Northbrae. Nestled in the rolling foothills amidst outcroppings of volcanic rock, Northbrae stands out for its spectacular bay vistas, environmentally sensitive design, connections to Berkeley’s unique, crisscrossing network of 136 paths and stairways, and two nearby commercial areas for shopping and entertainment. Oakland's Uptown District. Photo by Greg Linhares, City of Oakland. Uptown incubates the home-grown, artistic, and entrepreneurial spirit unique to Oakland. 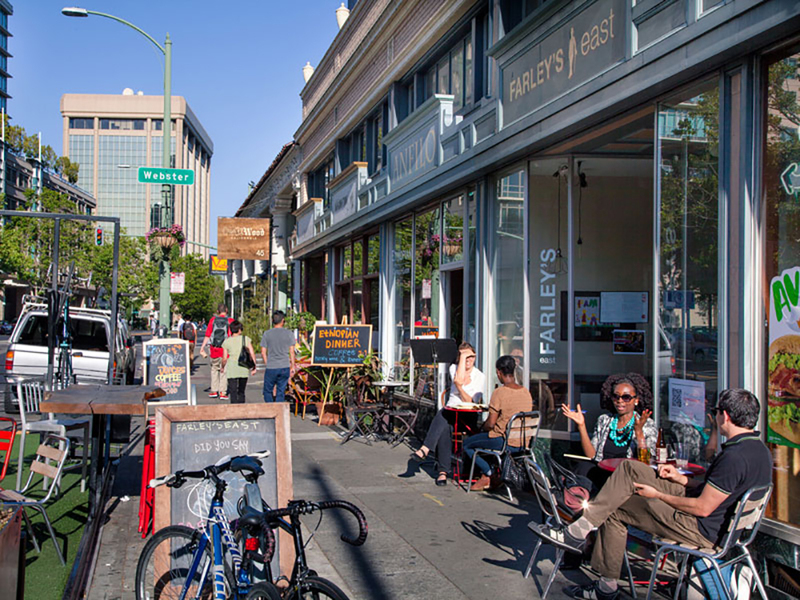 The neighborhood, once dominated by underutilized parking lots, has transformed into the Bay Area's premier arts and entertainment district. The New York Times ranked Uptown number five on its list of "45 Best Places to Go in 2012." The neighborhood is distinguished by the dedication of its residents and the concentration of arts, culture, and entertainment venues; restaurants; bars; and well-preserved historic buildings, all with close and easy access to transportation. See Uptown on your own or on the mobile workshop “Bringing Back Broadway” on Saturday afternoon at NPC19. Stockton Street is one of Chinatown's busiest and most vibrant streets and is home to several Asian companies such as the Hop Hing Ginseng Company and the Kowloon Market. Photo courtesy Chinatown CDC. Chinatown’s unique sense of place comes not only from its architecture and compact street grid, but also from a cultural identity that has persevered for more than 160 years. It is an immigrant gateway and the most densely populated neighborhood in the United States west of New York City. 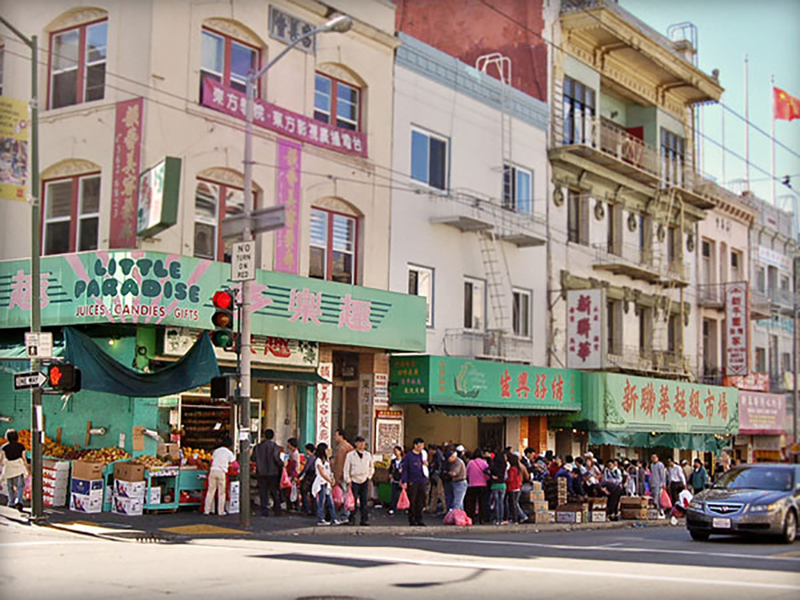 As a cultural capital, Chinatown is a touchstone for the 150,000-plus San Franciscans of Chinese heritage and their counterparts across America. Looking to learn about historic Chinatowns and their role in city revitalization? Attend the educational session “Immigrant Gateways: Chinatowns” on Monday afternoon at NPC19. Ferry Building in San Francisco at night. Photo by Flickr user David Yu (CC BY-NC-ND 2.0). Situated on the Embarcadero, the Ferry Building has been described as “a famous city’s most famous landmark.” Its distinctive features include a 660-foot high skylit nave and a 245-foot clock tower inspired by the 12th-century Seville Cathedral. Reopened in 2003 after extensive reconstruction, the Ferry Building is now used by more than 10,000 commuters a day and its great hall serves as a public market, with restaurants, historic galleries, and places to sit and enjoy the waterfront. View looking towards the North Beach neighborhood of San Francisco. Photo by Flickr user Photos by Clark (CC BY-NC 2.0). This neighborhood — nestled in a sunny, wind-protected valley among San Francisco's financial district, Chinatown, and Russian and Telegraph Hills — has evolved into one of the city's most unique communities. 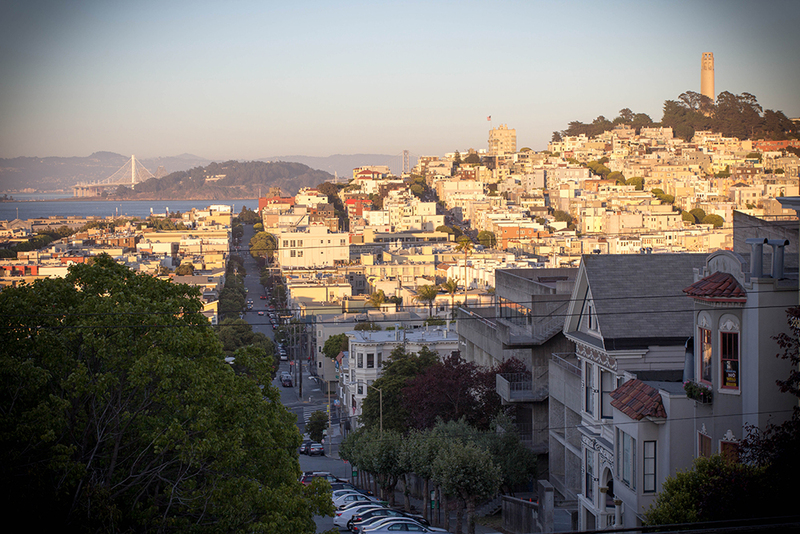 With the help of planning and zoning tools, North Beach has managed to preserve its essential character: a mix of tolerance and tradition in both its built and social environments. However, affordability — both residential and commercial — is an issue in North Beach as it is in the rest of the Bay Area. Top image: Golden Gate Bridge. San Francisco Travel Association photo by Scott Chernis Photography. Dustin Calliari is APA's senior content marketing associate.